On 'View Lines' I clicked Analyse and selected pairs, that is the pairs available from the entries created by the One-Click. We played the first few in the syndicate and the 3rd line had both numbers correct winning 60 times our stake. The 16th pair had also 2 correct that would have paid another 60 to 1 but I've only selected the first few pairs. 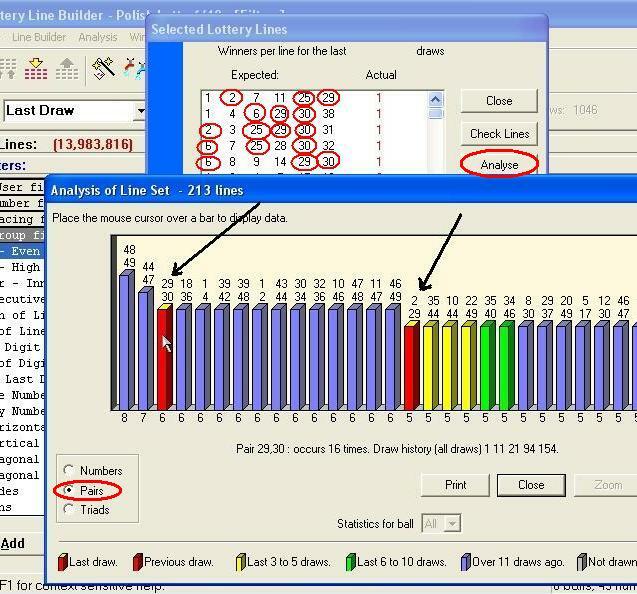 In the actual lines produced by LotWin were entries of 4 and many 3 correct as you can see above. If you were in Poland and played the lottery there 3 correct won 16 zl, 4 correct 119.20 zl, 5 correct 3916 zl and all 6 nearly 10,000,000 zl. It is worth mentioning that the full list produced by the One-Click was 4% of the total lines had only 5 not 6 correct but the Optimum Reduction for 3 out of 6 correct produced 4 correct!!! Read the post about the Magic of Optimum Reduction and watch the video. 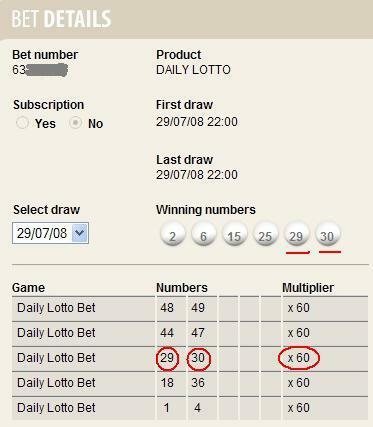 If you want to get paid 60/1 for 2 correct, 675/1 for 3 correct, 10,500/1 for 4 correct and 200,000/1 for 5 correct, login to your account or if you don't have an account register for free and see how and which lotteries I play. Read the previous posts to find out why.